A partnership has been formed between Circuit Scribe and MicroK12 to deliver the most revolutionary STEM electronics for educators across the Pacific Northwest. Similar to MicroK12, Circuit Scribe is driven by innovation, and both envision electronics to be a vital component within our education system. Students will have the opportunity to draw a circuit board simply by doodling on a piece of paper. 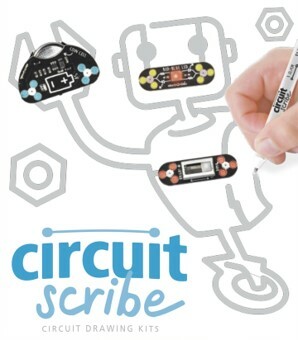 Circuit Scribe allows children to be involved with technology, yet in a fun, interactive, and creative environment. You may be wondering, what is the product and how does it work? Circuit Scribe begins with a rollerball pen that writes with conductive silver ink to construct a circuit onto scratch paper. To allow for a connection, a steel sheet is placed behind the paper, forming a magnetic connection, and this is where the magic begins. After drawing a simple line, with closed circles at both ends you will be able to snap together modules (power, input, connection and output), to the circuit drawing. Within the bundled kits there is a booklet of workshops to start with or create something from scratch. Create anything from a high five detector to an electronic book cover, the possibilities are endless. Classroom Kits: What is included? Two types of kits are designed to work well within a class size of about 25 to 30 introducing electronics to young and eager students. 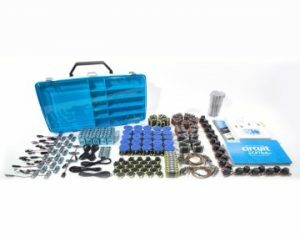 The Intro Classroom Kit includes a set of 25 pens and modules to draw basic working circuits that conduct power, LEDs, and switches. The kits are also equipped with an array of samples to try out, from Circuit Scribes advanced modules. The samples include, buzzers, blinkers, motors, multi-colored LEDs, and other fun tools. 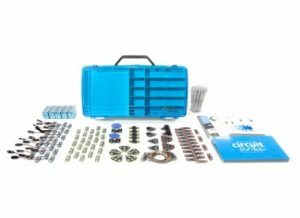 If you’re interested in the Everything Kit, this is a great way to dive deeper into electronics with a classroom or makerspace environment. Similar to the Intro Classroom Kit, all basic modules are included, yet now you’ll be able to test the advanced modules in greater depths. This kit is focused on creative exploration, adding an artistic aspect to any circuits project. Is Circuit Scribe the right fit for all grade levels? The answer is yes, all skill sets are welcome to try out this revolutionary product. Whether you’re a student, teacher, or find value in science and engineering, then Circuit Scribe is the right fit for you! If you’re interested in learning more about Circuit Scribe kits and featured products, check out our featured products for more information. Previous PostPrevious 3D Printing for Education Has Arrived!